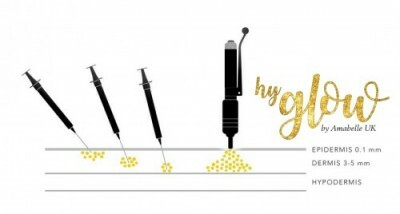 The HyGlow treatment is one of the newest innovations to the beauty and aesthetic market, after being used for a multitude of years in the medical field. HyGlow is known as the no-needle alternative to lip filler providing incredible results without the use of dreaded needles. 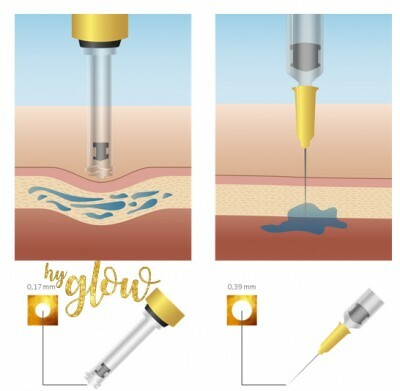 The device uses a microscopic hole through which hyularonic acid and biorevitalizants are injected under the skin; through being triggered by a specially devised piston with a spring. It provides such intricate and uniform administration, in the targeted treatment area that we do not need to peirce through the skin, using needles. The Hyglow is fantastic at producing new collagen to areas lacking. It also helps to plump, fill, smoothen and creates an overall 'Glow' to your skin! 100% true! We use a specialised device to help shoot the products into your skin to give you the results you are looking for. Ideal for those with needle phobias, those looking to shift from injectables, and those just looking to enhance their appearance!